Gov. 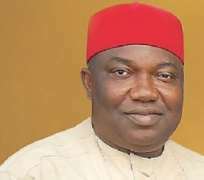 Ifeanyi Ugwuanyi of Enugu State has said that his administration's resolve to usher a new ray of hope and continued development in the state is on course. Ugwuanyi made the statement on Sunday in his 2016 Democracy Day celebration speech at Okpara Square, Enugu. The governor said that during his inaugural address one year ago he proclaimed that his election would bring continued hope and development to the state. He said that all the sectors of the state economy had received the needed breadth of fresh air. “We have among other things continued to sustain our well acclaimed free maternal health and childcare programmes and proper equipment and staffing of existing health institutions in the state. “We are also at the verge of completing the ultra-modern diagnostic centre in Enugu and the construction of the new specialist hospitals in the three senatorial districts,'' he said. Ugwuanyi said that industrial peace had continued to reign in the state as workers welfare was made a focal point of attention within the period. “Not only have we ensured regular payment of salaries and pensions, we were able to resolve the industrial disputes between the state government and workers in some of her agencies. “We successfully utilised the bailout fund from the Federal Government to liquidate outstanding pensions and subventions to parastatals, agencies and departments,” he said. He said that some public schools in the state that were in deplorable conditions were receiving attention to ensure that school children and their teachers enjoyed safe and conducive environments to learning. “The government has just approved the release of funds for the execution of three billion naira worth of projects for the renovation of over 276 public schools with the Federal Government providing 50 per cent of the sum. “We set in motion the process for the upgrading of the Institute for Management and Technology (IMT) into a degree awarding institution and intervened to rescue the institution from the crumbling weight of salary arrears,” he said. Ugwuanyi said that the agricultural sector had not been left out as the state government had acquired 20 tractors to be hired to genuine farmers at very low rates. “We also released counterpart funds for the robust participation of our state in the implementation of the two billion naira Staple Crops Processing Zone programme. “The programme is funded by the African Development Bank in conjunction with the Federal Government of Nigeria. “The fund is being channelled to the revival and expansion of the Adani Irrigation Scheme as well as the construction of feeder roads and other critical infrastructure that will catalyse agricultural development in the state,” Ugwuanyi said.